Although she was three thousand miles away, giving a concert on the West Coast, when the first annual “Betty Buckley Award” was presented at the 13th Street Repertory Theater in New York City, Betty Buckley served as the official presenter on videotape. 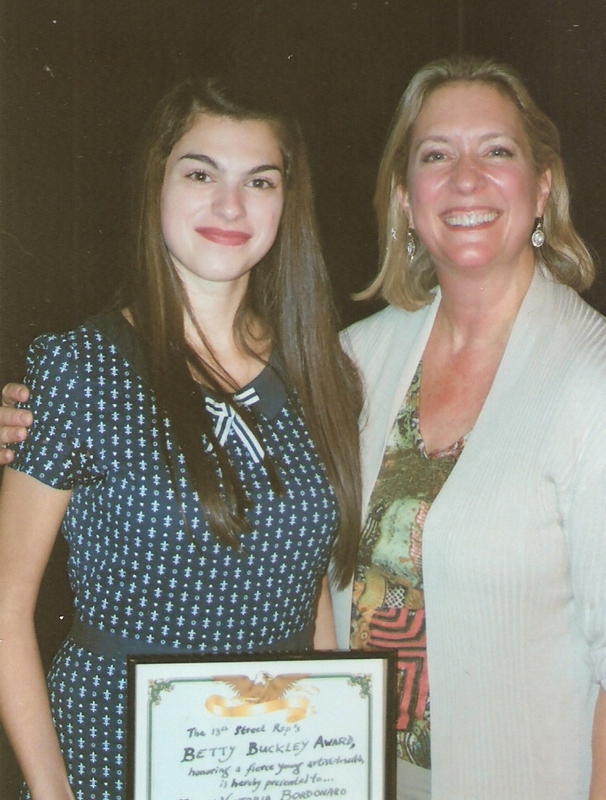 Introduced by master-of-ceremonies Chip Deffaa, whose plays have often been presented at the 13th Street Rep, Buckley–on videotape–presented the award to 18-year-old Emily Bordonaro of Avon, Connecticut. Bordonaro, who is currently appearing in Deffaa’s “Irving Berlin Ragtime Revue” at the 13th Street Rep (50 W. 13th Street, NYC), expressed deep gratitude at being chosen as the first recipient of the annual Betty Buckley Award. “It’s an honor to get something so special from a great star that I admire so much,” she said. “Standing in” for Betty Buckley at the theater, to physically present the award to Emily Bordonaro (as shown in the photograph), was MAC Award-winning cabaret/concert artist Carolyn Montgomery-Forant. She playfully suggested that she and her longtime friend Betty Buckley could be considered almost like family, since her son, Eli, and Betty Buckley happen to share the same birthday. She gave her own congratulations and compliments to Bordonaro (and invited Bordonaro to come see her November 21st at the Laurie Beechman Theater), and handed her the plaque. Also included as part of the award is a copy of Buckley’s very first album, “1967,” recorded when Buckley was still in her teens–and was then herself a “young artist-to-watch”– and a book Buckley has long found inspiring, “The Last Unicorn,” by Peter S. Beagle. According to Edith O’Hara, the 97-year-old founder/artistic director of the 13th Street Repertory Company, the theater’s mission has always been to nurture and encourage young performers; the new award is in keeping with that tradition. O’Hara recalls proudly that many accomplished performers have worked at the theater, early in their careers–including , Chazz Palminiteri, Bette Midler, Christopher Meloni, Giuseppe Bausilio, Amy Stiller, Barry Manilow. She’s all for encouraging young talent. And for the theater company, having a master artist like Betty Buckley (assisted by another seasoned pro, Carolyn Montgomery-Forant) present present an award symbolizes the passing down of traditions of professionalism, from one showbiz generation to the next. At the awards presentation, Deffaa noted he’s worked with Bordonaro (whom he praised as being “as talented as any young actress I’ve ever worked with”) on various projects since she was 11. He added that it seems particularly apt that Bordonaro is the first recipient of the Betty Buckley Award since she herself has actually been a student of Buckley’s. “And Betty Buckley is a terrific role model for any aspiring musical-theater performer,” Deffaa added. “She’s a consummate singing actress–powerful, focused, serious about her work–whom I’ve enjoyed on Broadway in shows ranging from ‘Triumph of Love’ to ‘Sunset Boulevard.’ And her portrayal of ‘Mama Rose’ in ‘Gypsy,’ which I caught at Paper Mill Playhouse, still remains the most satisfying and electrifying portrayal of that character I’ve ever witnessed. We’re honored that she’s agreed to help us with the encouragement of promising younger talent in this way.” Also honored with an award that day was Michael Kasper, who was presented with the Dominic Franco Award, for hard work and commitment. The theater company plans to present another special award, “The George M. Cohan Song-and-Dance Award,” in the very near future.